If you really care who is painted on the walls of the Waverly Inn, you can now read the book. 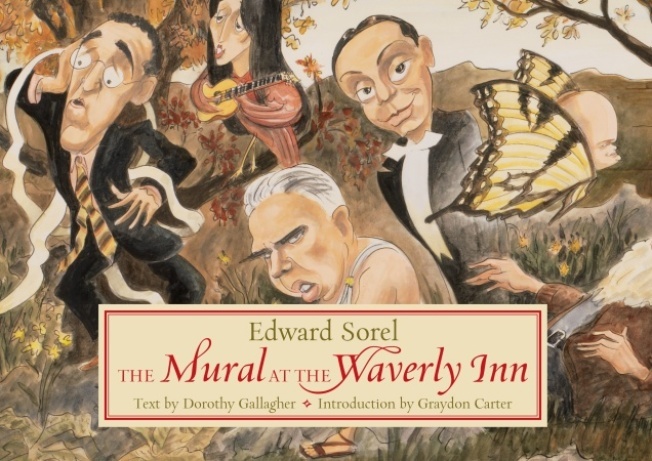 There's now a way to admire Edward Sorel's expansive mural covering the walls and snaking through the rooms of the Waverly Inn in Greenwich Village without having to brave the wait or the braying laughter of those waiting. The new book, The Mural at the Waverly Inn (Pantheon), is a 48 page who's who of the Greenwich Village lit-life luminaries whose likenesses grace the historic boite. Each of the 40 figures featured by Sorel gets a write up by Dorothy Gallagher. Sorel's work regularly appears in the pages and on the cover of the New Yorker and other publications. Of course, owner and Vanity Fair editor Graydon Carter makes an appearance, writing the introduction. All involved seem to miss the irony that while they are celebrating the landmark status of the place, Carter's 2006 "renovation" (a nicer word for gutting) destroyed much of the charm and history of the pub, which dated back to the 1920s. But without that gutting there'd be no Sorel mural, no book, no three hour wait, and no $50 mac and cheese entree.